After a few weeks of getting organised we are finally off on another Aussie Adventure for the third time. This time we are heading north to the tip of Australia - Cape York. We have made a loose itinerary but if this trip is anything like our last two our plans could change and any time. 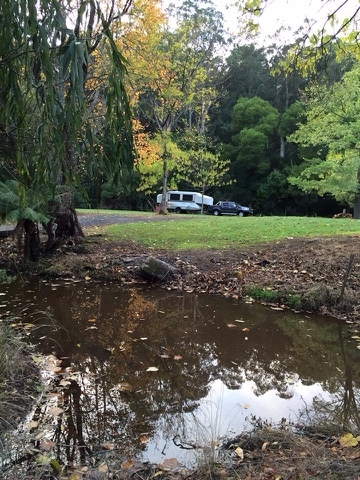 Our first night was spent at a free camp in the north east area of Victoria, Bellbird Creek. We camped behind the Bellbird Hotel in a lush green paddock surrounded buy evergreen trees and other trees covered in glorious Autumn colours. All the owners ask is that you spend some money in the pub, which is not a problem for us!! Waking up to kookaburras, various birds and cows mooing was an enjoyable start to our adventure. We are now having a couple of nights in Batemans Bay with my son Shane, daughter in law Stacey and my two adorable grandsons O'Shea and Finn. Tomorrow we will be heading inland for our 2,643 km journey up to Cairns.